DreamFactory Software says its open source REST API services platform is now available as a Docker container. The concept here is… easier install and management of custom deployments of DreamFactory across a wide range of platforms and environments. The firm reminds us that Docker containers are a simple and efficient way to install DreamFactory: they are inherently cross-platform and can be run on any machine that can run Docker. 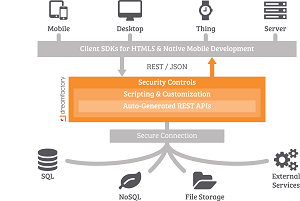 They also provide a streamlined deployment mechanism since they require inclusion of only the components necessary for the DreamFactory application. “Docker has emerged as an extremely popular deployment model for many modern web apps, and has particular significance for the rapid development of mobile apps in production environments,” said Bill Appleton, co-founder and CEO of DreamFactory.